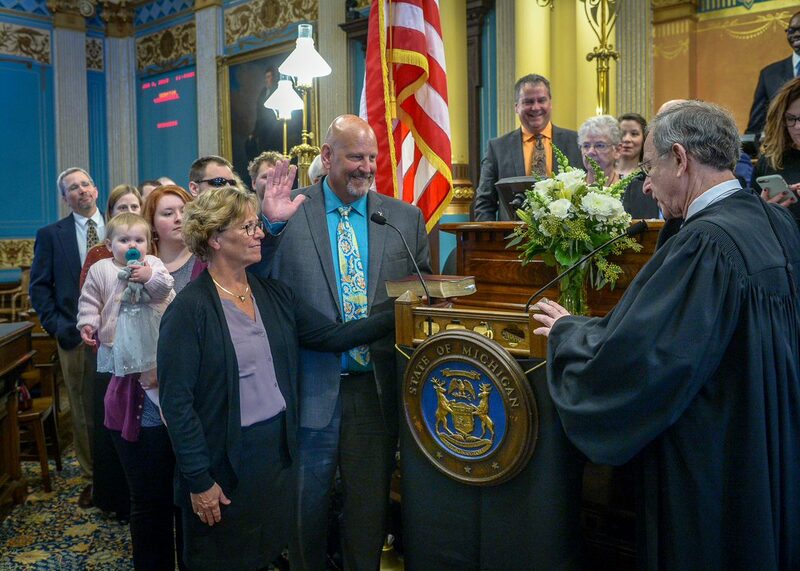 LANSING, Mich. — Sen. Curt VanderWall was sworn in as senator for the 35th District on Wednesday during a ceremony at the state Capitol. Michigan Supreme Court Chief Justice Stephen J. Markman administered the oath of office. VanderWall was joined on the Senate floor by his wife Diane; their son Nick, Nick’s wife Holly, and their daughter Kelsey; daughter Alyssa; son Hunter; parents Virginia and Marv VanderWall; in-laws Ralph and Judy Teichert; and several other friends and family members. Editor’s note:The above photograph of VanderWall is available by clicking on the image. It will also be available at the senator’s website at www.SenatorCurtVanderWall.com/photos. A video of the swearing-in will be available at www.SenatorCurtVanderWall.com/video.